Throughout the summer months you will see many tannish colored, delta wing insects perched in the vegetation at the water’s edge on the lower Deschutes River. These are adult aquatic moths. They swarm and regroup as you disturb them while walking or wading along the edge of the river. They especially like shoreline grasses along splashy riffles. Here, they pass the days in gregarious communities. Gatherings of aquatic moths can be very dense, often numbering in the hundreds per cubic meter. Adult aquatic moth populations will often be mixed with one or several species of caddis flies. You can tell the moths from the caddis. Moths have delta shaped wings while at rest. Caddis profiles are much narrower. If you catch a moth, it will leave some of its shiny wing dust on your hand. Caddis don't do this. 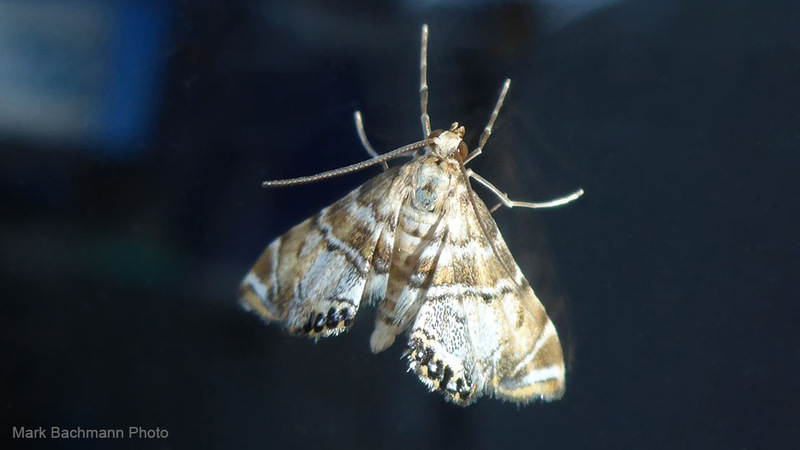 It seems aquatic moths are always at play, fluttering to and fro. They are often more active than caddis through the warmer parts of the day. Knowing this can extend your dry fly fishing period. Trout will key on these moths and snuggle right up to the edge of the river and wait for a moth to land on the water. Strikes are usually authoritative. Moth underside color can vary from tan to cream. Sizes vary from #14 to #16. Early season insects are larger that later ones. It seems that every location will produce hatches of large, medium and small moths. Hatches start at the mouth of the river in June and progress to Pelton Dam. There, they will trail off in August. Fish can be very selective to the size and color you are presenting. Check the adults thoroughly. The cream colored aquatic moth dry flies offered here have proven themselves to be convincing aquatic moth counterfeits. While the egg laying habits of these insects are not completely understood at this time, it does appear to happen in late morning and early evening when air temperatures are moderate. At least during these periods, moths are observed on the water and dry fly fishing can be outstanding. Look for rising fish and place your fly 4' to 5' upstream in the exact center of its feeding lane and success is nearly automatic. These flies are easy to see and track. This makes drag easier to control. It is also thought that females of these insects dive to lay eggs on the bottom of the river. Hairs on their bodies and wings trap air so that they can actually breath under water. 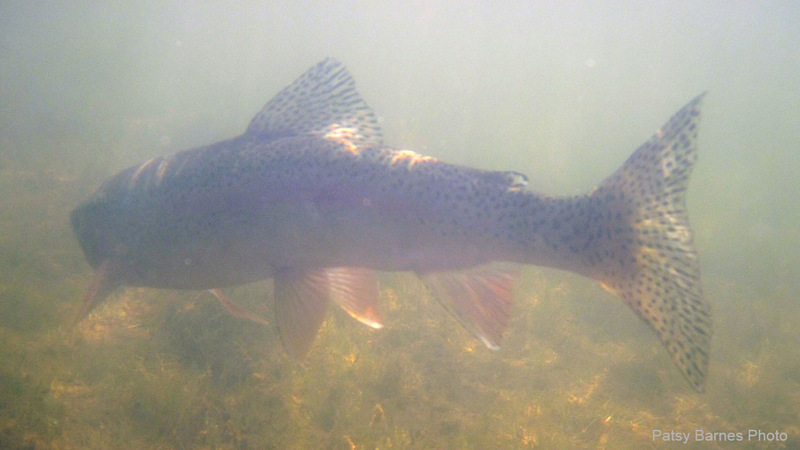 Some luck has been had swinging the dry pattern with a sinking tip, or drifting the dry fly deep with a split shot. 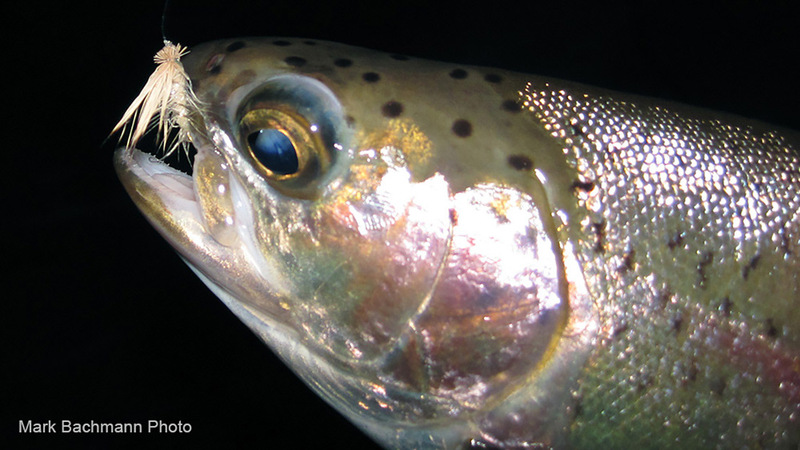 Above: A large Deschutes redband trout hangs out over a weed bed waiting to ambush aquatic moths that are clustered along the shoreline. Aquatic moths seek cover along the edges of the river in the vegetation or on boats, or anything that will shield them from the sun or wind. You can always tell when you are in aquatic moth habitat even before they hatch, because the larger rocks of the stream bottom will be covered with white or yellowish discs made from silk. These discs average about one half inch in diameter. 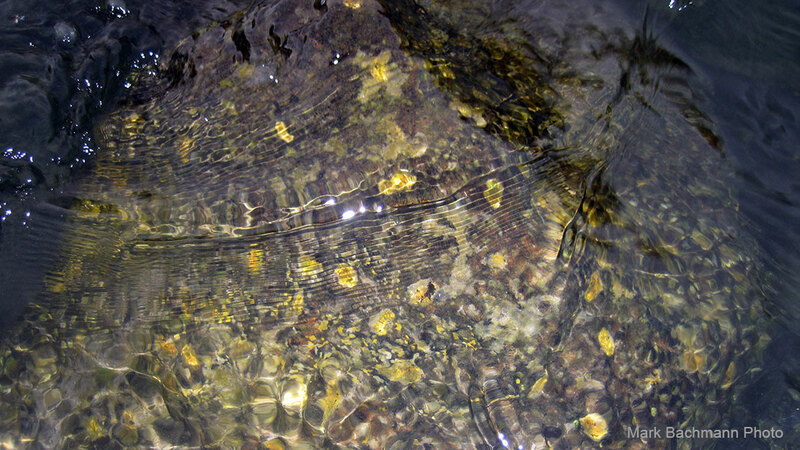 Below: A typical Deschutes River boulder covered with aquatic moth pupae.